Years ago, I came up with this phrase: “If you take the state’s nickel, you must take the state’s noose.” Above all, this is true of public education. There have been dozens of reform plans proposed by various special-interest groups that want the state’s money for education, but which supposedly will loosen the state’s noose enough so as not to choke the members of the various groups. These reform proposals all have failed to change the public schools. The noose steadily tightens, or else the money is declared unconstitutional by the courts. Every reform fails to reverse the steady decline of pubic education. Like a mastodon caught in the tar pits, the tax-funded system continues to sink. Once again, we learn, SAT scores have fallen. If anyone is surprised, he must have been educated in the public schools. This is political education. It is basic to every totalitarian state. It is also basic to every democratic state. It is based on the principle that the state, not parents, are responsible for educating their children. It transfers responsibility to the state. Parents cheer. They don’t want such responsibility. They are willing to be taxed in order to evade this responsibility. Once the state persuades parents to surrender their children’s intellectual and moral training to the state’s self-certified bureaucrats, the march on the road to serfdom is simply a mopping-up operation. In principle, parents say: “Take our children.” Once they do this, the defense of private property is undermined at the core. 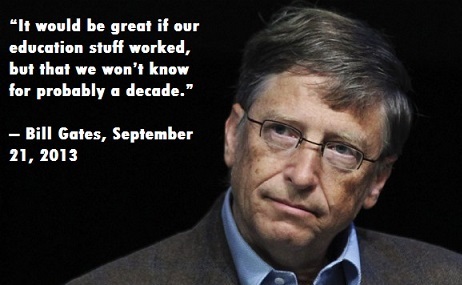 With this as background, consider the dilemma of Bill Gates. He spent $3 million to promote a charter school law in the state of Washington in 2012. It passed in a close election. The state supreme court just declared it unconstitutional, 6 to 3. The solution is the Gates-funded Khan Academy, which is free to all families, all over the world. Gates persuaded Khan to adopt Common Core standards by providing a curriculum support team, although Khan did not use Common Core for his original math video lessons. But this is online education. It does not provide free babysitting. A parent must stay home to be with the kids. This is considered an intolerable burden by the rich, who donated money to the 2012 charter school campaign. One of them is the widow of Sam Walton. The Supreme Court has said that there is no port in the tax-funded storm. If you take the state’s nickel, you must take the state’s noose. You will not be allowed to escape the teachers’ union. Online education is a low-cost, high-standard alternative. But it requires parental presence, and it does not offer football or pom-pom girls. “Unthinkable!” shout tens of millions of American parents. In a world of people trained in public schools, this really is unthinkable. The rich want tax-funded alternatives. They promote school vouchers. The voters vote down these programs, and if they don’t, the courts do. I first heard the idea proposed by one of Milton Friedman’s followers in the summer of 1962. It was fantasy politics then, and it still is. Here’s the deal: if you want your child out of the state’s children trap, don’t take state money. If you don’t think public schools are a children trap, read private school entrepreneur Robert Thoburn’s book, The Children Trap. I published it in 1986. You can download it free here. If you want noose-free education, sign up for the Ron Paul Curriculum. It is self-taught above grade 3. It is video-based, just as the Khan Academy is. But, unlike Khan, it rejects Common Core. Here are 26 reasons to sign up today.